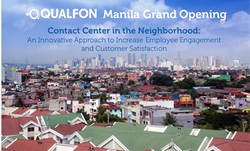 There really aren’t any contact centers in Manila neighborhoods, but Qualfon is on the leading edge of that change. We’re trying to spark a new revolution. Instead of making employees come to us, we’re bringing the jobs to the people. Qualfon, a mission-driven business process outsourcing (BPO) company and global provider of contact center services, will hold a grand-opening ceremony Thursday, August 4th at its new contact center tucked into a neighborhood district of “Old Manila,” Philippines. The event will showcase Qualfon’s fourth location in the country, highlighting what executives call “a fresh and innovative neighborhood contact center approach designed to bring jobs to the people, reducing commute times, enhancing the quality of life, and boosting employee engagement and customer satisfaction.” The new site is located on the 4th floor of the Robinsons Otis Shopping Center in the residential community of Paco, among neighborhoods, universities, and retail attractions. The grand-opening ceremony will unveil the state-of-the-art center with presentations, tours, and a ribbon-cutting celebration. Invitees include Manila’s City Mayor Joseph Estrada, as well as senior leaders from the Information Technology and Business Process Association of the Philippines (IBPAP) and Contact Center Association of the Philippines (CCAP), and BPO industry analysts. As part of the event, attendees will hear from Qualfon’s most senior leaders and executives. Members of the media, Qualfon’s partners in the community, clients, prospects, and members of the local community are invited. After the ceremony, attendees will have the option to take a guided tour of the contact center. Get an official invitation and more information about the event by sending an email to Marketing(at)Qualfon(dot)com. “Qualfon’s Manila location denotes our new neighborhood contact center strategy, which is all about putting job opportunities in the university communities and neighborhoods where the young people of Manila study and live. This strategy is rooted in our mission to make people’s lives better and the reality that connecting with families and local communities builds stronger relationships that result in deeper engagement and superior service,” said Qualfon CEO Mike Marrow. The contact-center-in-the-neighborhood strategy also helps with transportation and increases the quality of life for employees. As Marrow explained, the larger metro area is dense with contact centers huddled around IT parks and high-rise business districts. Consequently, many people have to commute hours to and from work. “There really aren’t any contact centers in Manila neighborhoods, but Qualfon is on the leading edge of that change. We’re trying to spark a new revolution. Instead of making employees come to us, we’re bringing the jobs to the people,” he said. Qualfon’s Paco contact center will employ up to 1,200 people when at capacity. Operations are already underway at the roughly 35,000 square-foot facility where the first 50+ employees currently provide customer support services on behalf of the communications industry. The 580-seat center sits near the historic core of Manila, at the doorstep of the University of Philippines Manila and just a mile or two from 20 other colleges and universities.